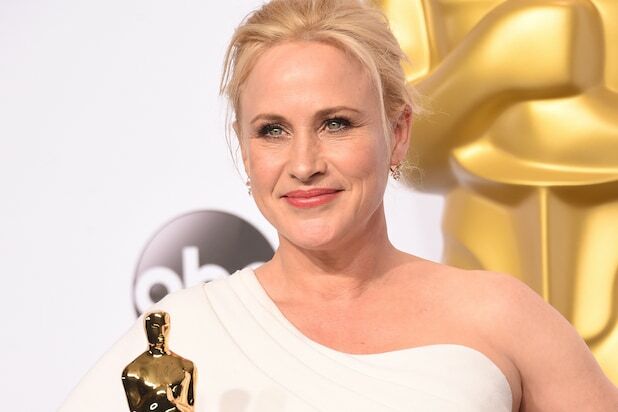 When Patricia Arquette gave her now famous, “It’s our time to have wage equality once and for all” Oscar acceptance speech last month, it seemed as though she could do nothing wrong. Meryl Streep made a “you go, girl” gesture, Jennifer Lopez smiled from ear to ear and pretty much everyone else at the Dolby Theatre looked delighted. Asked to elaborate on her speech backstage, the newly minted Academy Award-winner fumbled her words. One line in particular ignited a tsunami-like backlash. “It’s time for all the women in America and all the men that love women, and all the gay people, and all the people of color that we’ve all fought for to fight for us now,” Arquette said after receiving her award. Arquette has no regrets, but she admits she could have said it more eloquently. What she meant to say, she told TheWrap, was that “women lose from half a million to a million dollars over their lifetime,” because they make less compared to men. “In California alone, women [in total] lose $33 billion a year in income and that’s money that’s not going into their retirement. But, no one seems to want to do anything or move on this issue,” she said. It’s an issue that’s dear to her heart, she says, and one she has apparently studied extensively. If there’s a silver lining, it’s the fact that people are talking about. And that was Arquette’s intention all along. Watch Arquette’s backstage interview at the Oscars here. “CSI: Cyber” premieres Wednesday at 10 p.m. on CBS. Melissa Rivers paid a touching tribute to her late mother during E!’s “Live From the Red Carpet” show. The “Fashion Police” executive producer honored the late comedienne with a video that looked back on some of her most memorable moments with some of Hollywood’s biggest names, from Will Smith to Sarah Jessica Parker. Lady Gaga still had a great night overall with her scintillating "Sound of Music" tribute, but her red carpet look was a dud. She wore an Azzedine Alaia gown and red leather gloves that belonged on a welder or crab fisherman. Nyong'o stole the red carpet in a hand-embroidered Calvin Klein collection gown made of 6,000 mother-of-pearl beads. For a returning champ, perfect fashion is the best way to make an impression at the Academy Awards. The Oscar-nominated "Wild" star helped the #AskHerMore trend go viral on Sunday, which begs the world to look deeper than an actress's gown, hair and accessories on the red carpet. Travolta surprised Scarlett Johansson with a cheek kiss on the red carpet and later the handsy "Wild Hogs" star surprised the whole world by repeatedly touching Idina Menzel's face on stage. The first-time Oscars host wasted no time before getting into a pitch-perfect opening that celebrated movies with co-singers Anna Kendrick and Jack Black, holograms and backup dancers that included "Star Wars" stormtroopers. While Neil Patrick Harris brought his usual magic to the opening Oscar number, an unexpected surprise came in the form of Jack Black. Singing a funny-but-poignant indictment of the current superhero-centered industry, Black belted about Hollywood: "It's run by muckety mucks, pitching tents for tentpoles and chasing Chinese bucks. Openings with lots of zeroes, all we get is superheroes ... the only screens we're watching are the screens in our jeans!" Jennifer Aniston and Justin Theroux sneaking into Jennifer Lopez's Instagram selfie reminds us that even A-list audience members get bored and make the best use of their time (and J. Lo's smartphone frame). Oprah Winfrey has worked her Hollywood muscle for years with zero Golden trophies to show for it—but the folks from the Lego Movie finally righted the grave injustice. The former daytime queen was handed a well-earned Lego trophy during the Lego Movie performance—her ecstatic face sang "Everything is Awesome." The actress took home the best supporting actress trophy on Sunday for her role in "Boyhood," but she earned a standing ovation for another accomplishment. Arquette made a plea for equal wages for equal work during her acceptance speech and also offered poignant words for all of the mothers of the world. Harris showed off a buff bod as he walked on stage wearing nothing but tighty-whities and black shoes, nodding to a similar scene from “Birdman.” As the show returned from a commercial break, Harris could be seen backstage locked out of his dressing room wearing next to nothing, and cameras followed Harris as he walked on stage in his skivvies, giving audiences an eyeful. For a ceremony criticized over its incurable whiteness, some of the Oscars best moments belonged to performers Jennifer Hudson, Common and John Legend, whose musical renditions brought down the house, along with not a few tears. Lady Gaga stunned the Dolby Theater with a medley of songs from "The Sound of Music" using just her voice -- and none of the usual abstract stunts from her life and commercial work. The comedian wasn’t just a standup comic, talk show host and red carpet staple. She also appeared in or provided her voice for several films, including “The Muppets Take Manhattan” and “Look Who’s Talking.” Most of all, she wrote and directed the provocative drama “Rabbit Test,” which starred Billy Crystal as a pregnant man. Isaacs applauds free speech in a year that saw terror threats over "The Interview" and a tragic killing at French satirical newspaper Charlie Hebdo. Neil Patrick Harris joked about the race issues plaguing this year's Oscars during his opening monologue, but Academy president Cheryl Boone Isaacs stayed completely mum. We know he was honoring the written word, but when one of the greatest comedians of all time takes the stage, we expect him to do more than read off a cue card. He ticked off the nominees like it was a groceries list and didn't crack a single joke. The Oscar-winning "Imitation Game" screenwriter delivered a moving and personal acceptance speech: "I tried to commit suicide at 16 and now I'm standing here. I would like for this moment to be for that kid out there who feels like he doesn’t fit in anywhere. You do. Stay weird. Stay different, and then, when it's your turn and you are standing on this stage, please pass the same message along." The "Theory of Everything" star solidified his spot in cinema history on Sunday by beating out a tough class of competitors for Best Actor, and he didn't waste his opportunity on the big stage. He dedicated his victory to the Hawking family and everyone suffering from Amyotrophic Lateral Sclerosis. The "Still Alice" star took home the Best Actress trophy on Sunday, as many expected, and started off her acceptance speech with a hilarious joke: "If winning an Oscar means I get to live five years longer, I'd like to thank the Academy because my husband is younger." Neil Patrick Harris started his prediction joke on a Sunday and wrapped it up on a Monday. We respect his commitment to the bit, but once it hits midnight on the East Coast it's time to consider cutting everything except essential moments, like the Best Picture winner. Oscar-winning actor Sean Penn took a dramatic pause before announcing the Best Picture director which. Lasted. Way. Too Long. Then he followed it up with an off-color joke about "Birdman" director Alejandro Iñárritu. We know the two of them are friends and have worked together before, but "Who gave this sonofabitch his green card?" will go down as one of the worst Oscars introductions ever.